Embark on your ultimate luxury experience in Southeast Asia. Stay at the finest accommodations and enjoy white glove service as you travel, with our dedicated team of experts at your disposal. 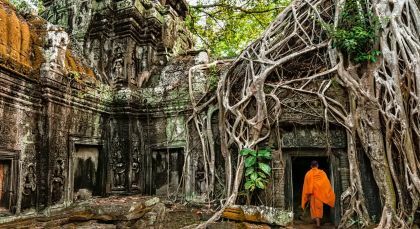 Discover a unique water world on your luxurious Mekong River cruise from bustling Ho Chi Minh City in Vietnam to historic Siem Reap in Cambodia. Along the way, gain a unique perspective about life on the river, visit bustling local markets and UNESCO World Heritage sites, and learn the intricacies of delicious Khmer cuisine. 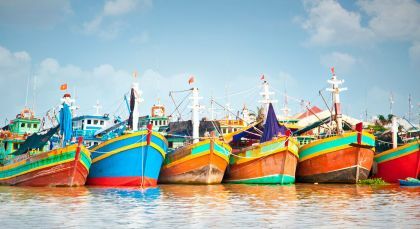 Explore the Mekong Delta on this leisurely weeklong cruise from Saigon to Siem Reap, via Cai Be, Tan Chau, Phnom Penh, Kampong Cham and Kampong Chhnang. Your river cruise begins from My Tho, near Saigon. Settled into your spacious cabin, wake up to Tai Chi sessions every morning, followed by a sumptuous breakfast spreads. Each day brings new opportunities to explore and discover charming villages on the riverbank, including Cai Be, famous for its ‘floating market’ of boats that ply the town’s dense network of canals. Along the way, hop aboard traditional sampans (boats) and visit local workshops that make rice paper, wine and rattan furniture, fish farms, markets, temples and picturesque villages. In your free time, pamper yourself with spa treatments, swim in the open air pool, enjoy high tea or sign up for cooking lessons from the chef. Your evenings are spent with watching movie screenings and enjoying romantic al fresco dinners on the deck. 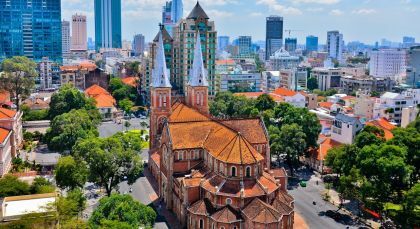 Once you dock at Phnom Penh, board a tour bus and set out to discover historic sites, glittering architecture as well as the avant-garde restaurant. Back on board, you’ll be regaled with a fascinating talk on Cambodian history by an eminent professor from the Royal University, followed by a classical music and dance performance during dinner. As you drop anchor at the untouched village of Angkor Ban, discover authentic Khmer culture and architecture, or sail further to visit a local school and ancient monasteries perched along the Mekong. Also, on your itinerary are visits to Cambodian silk workshops as well as a blessing ceremony by monks who come onboard for a while. Further upriver, the ‘water world’ of Kampong Chhnang offers a spectacular floating kingdom you can explore on boat. On your final evening, savor a special farewell dinner with music and dance as you drop anchor near Siem Reap, the gateway to Angkor Wat. 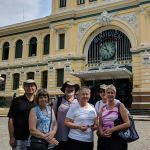 From our first contact with Walter who planned a wonderful itinerary, to Ashwini who made sure to make contact while we were in Asia, Enchanting Travels made our trip fantastic! The unique activities were so well chosen and the guides were well informed. We can’t wait to take our next trip with you!